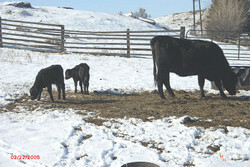 Canada said a 6-year-old cow in Alberta tested positive for mad-cow disease, the fourth domestic case since May 2003. The infected animal didn't enter the food chain, Brian Evans, chief veterinary officer for the Canadian Food Inspection Agency, said today during a conference call and press conference in Edmonton, Alberta. Surprising, no. Upsetting, yes. It will be curious if they can track down how the cow got it and I would be real curious to know if it's a beef cow or dairy cow. The animal didn't enter the food chain so that's a plus. The United States response to this? "I appreciated the opportunity to speak with Canadian Agriculture Minister Andy Mitchell today, who apprised me of the new BSE detection in Canada. I assured him that based on the information he supplied, I anticipate no change in the status of beef or live cattle imports to the U.S. from Canada under our established agreement. As I've said many times, our beef trade decisions follow internationally accepted guidelines that are based in science. "We will continue to evaluate this situation as the investigation continues. I have directed our USDA team to work with Canada and its investigative team. Minister Mitchell has pledged his full cooperation. "I am confident in the safety of beef and in the safeguards we and our approved beef trading partners have in place to protect our food supply. We will continue to adhere to international guidelines in our relationships with all trading partners, and my hope continues to be that we achieve a system of science-based global beef trade." I wouldn't expect the big meat packers/USDA to do/say anything else. I do have a question about all of this though. As I mentioned the other day it has been reported that Canadian meat and poultry inspections were lacking but the big meat packers/USDA was still letting meat come into the US even though the inspections don't meet the minumum standards set for the US. With this being the case, is it still wise to continue to let Canadian beef into the US until this inspection thing is figured out? I personally am not to sure. This whole BSE is something we are going to have to continue to live with so as an industry we need to get used to such excitment as this. Maintaining a vigilant defense is the best way to deal with it. I just wish the USDA would divorce itself from the big meat packers so beef producers and American consumers would have more faith that they are doing their jobs right in protecting our meat supply. Talk about maddening! When I read Johann's response yesterday I was sickened. How can we expect Japan and other SE Asian nations to reopen trade with us, given their fear of BSE, if we allow blind imports from a nation that obviously has more cases than they want to admit? I can't argue with you but I'm to the point I don't want to waste the energy being mad. The USDA will do whatever the meat packers tell them to do and to hell with the little guy and the American consumer. Until the American people wake up and take charge of the situation all I can do is be a voice in the wilderness trying to get the message across.